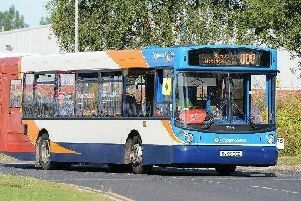 An elderly couple today relived the horrifying moment they were left trapped under a coach close to a Blackpool hotel. Holidaymakers Jimmy and Fran Moon had just arrived at the Grand Metropole Hotel on the resort’s seafront, at 1pm on Monday, when they were struck by the National Holidays coach which had brought them over from Hartlepool. Onlookers told how they watched on in horror as the coach, which was reversing slowly, trapped the pair, who are both in their 70s, leaving them lodged under the vehicle for 25 minutes while emergency crews worked to free them. And sister-in-law Christine Bishop and partner Tony Martin, who the couple are holidaying with, have told how they were left powerless as the 19-tonne vehicle trapped their loved ones. Miraculously, despite their ordeal, the holidaymakers escaped with only minor injuries. Mrs Moon, 76, said: “We were walking from the bus and all of a sudden, the next thing I know, the bus hit us and we were underneath it. “I was on my stomach and couldn’t get out and my face was bashed into the ground. “I put out my arm and started shouting for help and a young man banged on the bus. “I thought that was it, I felt like life was coming to an end. “I can’t sleep now, I just keep reliving it over and over and over. Mrs Moon said she didn’t realise her husband of 56 years was also trapped under the coach until she had been pulled free. She said she fainted when she realised he had also been trapped. She added: “It happened that quickly I didn’t even know Jimmy was under the bus until a man pulled me out, I fainted. Emergency crews were called to the scene, behind the hotel on Princess Parade, and firefighters from Lancashire Fire and Rescue’s Forest Gate and urban rescue teams worked to lift the coach to free Mr Moon, a former steel worker. Paramedics worked at the scene to comfort the couple before they were taken to Blackpool Victoria Hospital. Friends have said the couple, who have visited Blackpool regularly for the last four decades since their children were young, are “lucky to be alive” after escaping with little more than cuts and bruises. Mrs Bishop, 65, said she was in the hotel when Mr Martin, 68, ran in to tell her the pair had been knocked down. She said: “I didn’t know what to think. I couldn’t see Jimmy at all, he was right under the coach. I thought they were dead. “Jimmy landed on his nose and that’s all swollen and he has black eyes. Fran has landed on her arm and she’s bruised her knee. “It was awful. I thought our Jimmy had died. It was a hell of a relief that he was all right. “It was so scary. The police called me to one of their cars and then someone walked over and was shaking their head, I thought they had died. The couple’s daughter Karen Hill, 50, said: “They have been very lucky, the paramedic said they must have a guardian angel. “They were knocked to the ground and the bus had driven over them, but they weren’t hit by the wheels. “The way they fell to the ground they were between the wheels.” The couple, who have five children, five grandchildren and seven great-grandchildren, are now looking forward to continuing their holiday, which was a Christmas present from their daughter. Mrs Moon added: “I was so relieved when they said Jimmy was OK. It’s not every day two people survive being hit by a coach. It just shouldn’t have happened.